It’s finally here! I planned on making a ‘bumpy’ popcorn crochet stitch hat (or toque) ever since I made the popcorn scarf nearly 2 years ago. It’s one of those projects that’s been on a list of things to do and never quite made it to the top, until now. Over the weekend, we visited Michaels where I found 3.5 ounce balls of Bernat Waverly yarn in this olive ‘bark’ color piled in a clearance bin for $2.49. An excellent price, so I picked up a few for my crochet hat donation projects. The project used exactly 1 ball of yarn. After crocheting the hat and sewing it up, I had a strand of yarn only about 3-4 feet in length. This was my first time using the Waverly for Bernat yarn and it crocheted nicely until I neared the end of the ball. It contained 2 tie-off knots in the yarn which created a painful mess, causing the yarn to catch and get tangled on itself. In desperation, I had to cut the yarn once in order to sort it all out before I could finish my final few rows of crochet. I like this crochet hat a lot because it’s quick and fairly simple. The key to success is counting your stitches as you go to make sure you don’t get off track. You’ll notice that this crochet hat pattern is a combination of two other crochet projects I’ve previously posted, the Ribbed Crochet Hat Pattern and the Bumpy Popcorn Crochet Scarf (make sure to review this post as it contains a video on how to make a popcorn crochet stitch). You crochet in rows that taper on one end so that when sewn shut there isn’t as much bulk at the top. The popcorn stitches occur every fourth row and will be offset in alternating rows of either 3 or 4 popcorn stitches. Row 3: SC BLO in each chain until the end of the row. Chain 1, turn. Row 4: SC BLO in each chain to the end of the row (including each of the five chains that were previously skipped. Chain 2, turn. Row 5: DC BLO in next six chains. In 7th chain, make a popcorn stitch. DC BLO next 5 stitches. In 6th stitch, make a popcorn stitch. DC BLO in remaining stitches to end of row. Chain 1, turn. Rows 6-8: Repeat rows 2-4. Row 9: DC in back loop of next nine chains. In 10th chain, make a popcorn stitch. Continue alternating between * and ** until you’ve attained 14 total rows of popcorn stitches. You will end on a row containing 3 popcorn stitches since the hat started with a row of 4 popcorn stitches. The length of the hat will be about 17-20″ which is an adult sized hat. Using a yarn needle, sew the hat seam closed beginning at the wider end so that you end at what will be the top of the hat. Run the needle around the top opening in the hat and draw closed, then knot, snip yarn with a 3″ length and weave into surrounding stitches. Very nice – I guess I can’t crochet with children aroud – my counting will be off between charting to them! What is a good way to learn to learn to crochet? I think you may have encourage and inspired me to give crocheting a try. I will look at some of your ‘basic’ tutorials and see! I love this hat, and although I’ve avoided popcorn stitch in the past I’ve taken the plunge and am going to make one for myself! I was just wondering, as a Canadian, whether you use American or British terminology in your pattern? I’d hazard a guess from the photo that it’s American, but I thought I’d check before I started on it. 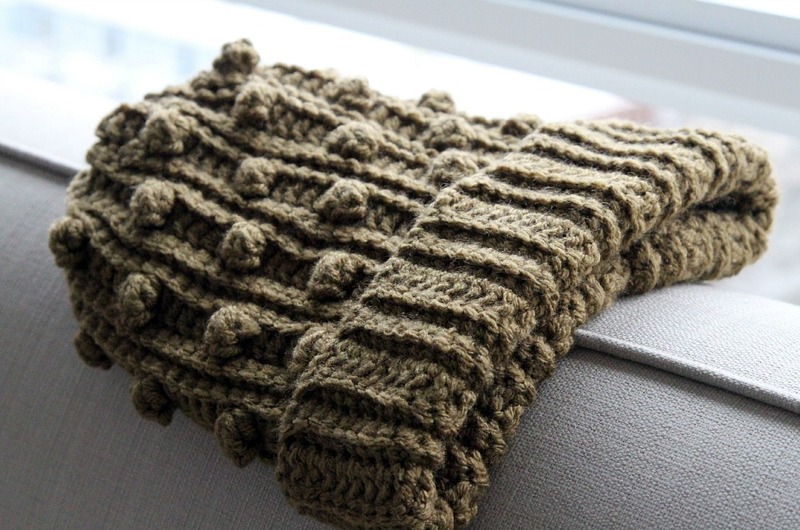 Thanks so much for sharing a great pattern! I use the American system generally as it’s the one I grew up using the most. Best of luck with the popcorn stitch, it’s very easy so don’t be intimidated! Just finished my first one of these! It was really easy and it fits great. I love the bit of stretch the ribs give it. Way better than the hats I’ve made in the round. Just starting this hat for my father. He was jealous all the kids got hats for Xmas! Will let you know how it turns out. Thanks for the pattern! Hi Allen, I love your patterns. You’re very talented. I’ve loved crochet for years and am always looking for patterns and designs that don’t look like typical crochet designs. Your hat is so cute and actually looks knitted. Can’t wait to try your pattern! Love the popcorn scarf too. Finished it and added it to Ravelry. Thanks again for the pattern! It is supe comfy! Allen, I just recently finished the Bumpy Popcorn Stitch Scarf. The ladies at my church are currently crocheting and knitting scarves to send to an orphanage outside of Mbabane, Swaziland – winter is coming to Southern Africa. Anyway, I wanted to make a hat to go with the scarf and somehow initially missed this pattern on your Website. Wanting to create a hat that was made in a circle, starting at the crown and working out, I adapted a pattern I had, putting the popcorn stitch into that pattern. The hat turned out ok – I don’t know that an adult would wear it, but I think a child will and think it is funky. I will be happy to send you that pattern if you’re interested.